Ah, my favorite time of year. NAMM (National Association of Music Merchants) holds a huge trade show in Anaheim each year, and there always follows a cornucopia of interviews from companies in the ukulele space. The show is an opportunity for manufacturers to connect with vendors who sell the products. Lucky for us, the ukulele community has lots of attendees who record their talks and share them so we can learn what’s new with ukulele gear. 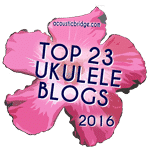 With ukulele videos, there’s The Ukulele Site and then there’s everyone else. I’ve featured their (so far) fairly short playlist of NAMM videos, followed by a MEGA playlist I have created of everyone else. The Ukulele Site always has amazingly high quality videos, and their NAMM coverage is no exception. They will be adding to this list over the coming days and weeks. And here’s my MEGA playlist with everything else, starting with a great highlights video from Daniel TimTim. Enjoy!